The Wittig reaction is the overall substitution of a C=O bond having a C=C bond. It lets one to selectively make alkenes in a way unmatched via any other methodology. The starting materials are an alkyl halide and an aldehyde or ketone. This is a reaction between a carbonyl compound (that is, only aldehyde or ketone) and a species termed as a phosphonium ylide. The ylide is a species by a positive and negative charge on adjacent atoms. A phosphonium ylide carries its positive charge on the phosphorus. 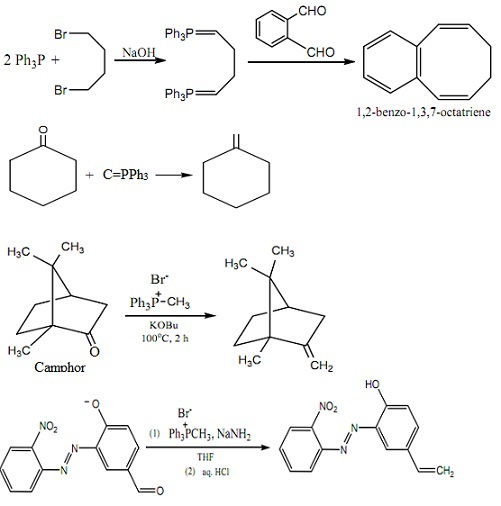 The reaction of a phosphorus ylide by an aldehyde or ketone, as first illustrated in the year 1953 by Wittig and Geissler, is probably the most broadly recognized process for carbonyl olefination. This so-called Wittig reaction consists of a number of benefits over other olefination processes; in particular, it takes place by total positional selectivity (that is, an alkene for all time directly substitutes a carbonyl group). By comparison, a number of other carbonyl olefination reactions often take place by double-bond rearrangement. Moreover, the factors that affect E- and Z-stereoselectivity are well understood and can be readily controlled via careful selection of the phosphorus reagent and reaction conditions. A broad variety of phosphorus reagents are known to participate in the Wittig reactions and the precise nature of such species is generally employed to divide the Wittig reaction into three major groups, namely the ''classic' Wittig reaction of phosphonium ylides, the Horner-Wadsworth-Emmons reaction of the phosphonate anions and the Horner-Wittig reaction of phosphine oxide anions. 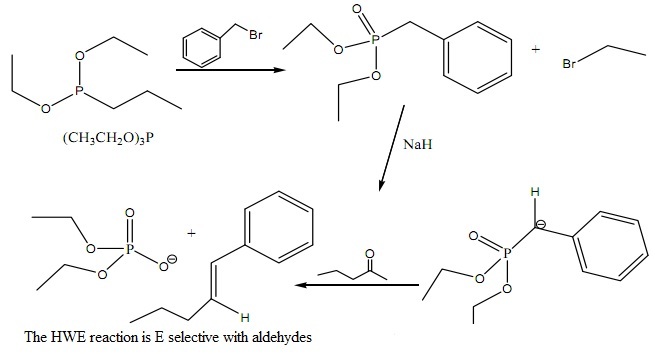 Each of such reaction types consists of its own distinct benefits and limitations, and these should be taken into account when choosing the suitable method for a desired synthesis. Ylides are made up from alkyl halides via a two-stage procedure. The first step is a nucleophilic substitution whereby an alkyl halide is allowed to react with a phosphine (triphenylphosphine) to provide a four coordinate phosphine cation. In the second step, the phosphonium salt is suspended in a solvent like diethyl ether or tetrahydrofuran (THF) and treated by a strong base (such as n-butyl lithium) in order to eliminate a proton from the carbon bonded to phosphorus to provide a neutral compound termed as a phosphorous ylide. The negatively charged carbon of the ylide can act as a nucleophile and attacks the carbon of the aldehyde or ketone. 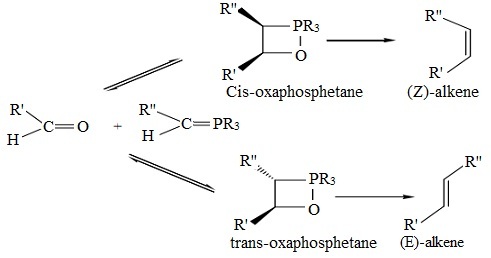 The procedure of the Wittig reaction has long been considered to comprise two intermediate species, a diionic betaine and an oxaphosphetane, as illustrated in the scheme below. Though, there has been much debate as to which of such two species plays the most significant mechanistic role and as well as to how each affects the stereochemical outcome under dissimilar reaction conditions. For numerous years, it was usually accepted that the betaine is more significant intermediate; though, recent low temperature 31P NMR studies recommend that this might not be the case. This assumption is further supported by recent computations that reveal that oxaphosphetanes are of lower energy as compare to the corresponding betaines. 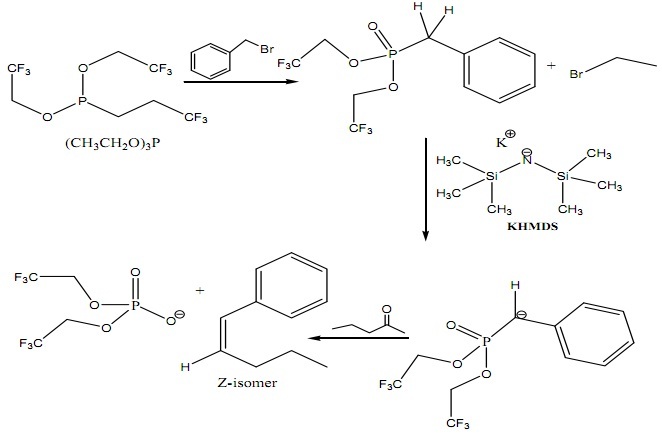 As such, the presently accepted mechanism for the Wittig reaction is as illustrated in the scheme that follows. The phosphine is incredibly big and there is a main steric factor regulating the stereochemistry of the addition. The remarkable thing is that for simple compounds, the reaction is Z selective. The reaction is in kinetic control. The first step of the reaction between the ylide and the carbonyl comprises the formation of an intermediate known as a betaine. The carbonyl approaches the ylide carbon turned at a 90° angle with respect to the Carbon-Phosphorus bond. This path is the best path in terms of sterics and is as well consistent by a detailed molecular orbital analysis of the problem. Once the betaine is made up, the oxygen atom can swing over and form a new covalent bond to the phosphorous atom. Phosphorous likes to make five bonds and makes very strong bonds to oxygen in particular. The result of this latest bond is a four membered ring compound known as a oxaphosphetane. Whenever the oxaphosphatane makes the stereochemistry of the substituents turns out to be cis. This is because of the selected path of the carbonyl if the betaine was formed. This signifies that the favored final alkene product will be the Z isomer. The Z isomer is not the thermodynamic product, it is the kinetic product. The key to a good result of the kinetic Z isomer is to reduce anything which would equilibrate the betaine and therefore the subsequent oxaphosphetane ring. Carrying out the reaction at low temperature assists, so does minimizing extraneous salts that would help in stabilizing the charged intermediates. However what if one wished for the thermodynamic product, the E isomer? Then one would want to intentionally isomerize the betaine to lead to the more stable product. A process for doing this has been discovered via a chemist named Schlosser. It comprises the addition of a mole of strong base, generally phenyl lithium, to the betaine. The added PhLi deprotonates the betaine and leads to the isomerization. The E-alkene is the ultimate result. The Wittig reaction works very well by aldehydes. It can as well be employed with ketones; however the stereochemistry control is not as good. One restriction of the Wittig reaction is that phosphorous ylides which contain stabilizing groups subsequent to the negatively charged carbon are not reactive sufficient to undergo the desired reaction by a carbonyl. The stabilizing groups can spread out the negative charge through resonance and therefore reduce the nucleophilicity of the carbon atom. The way around the problem is to make use of a more reactive phosphorous compound to make the ylide. The most popular process is the Horner-Wadsworth-Emmons (HWE) reaction that begins by triethyl phosphate to make a phosphonate ester. The phophonate ester products will react by a base like NaH to provide ylides reactive adequate to carry out the reaction. The reaction is adequate slow that it provides the thermodynamic E isomer. However what if we wished for the Z isomer of an alkene derived from the stabilized ylide? People have worked on that problem too. A chemist named still found that if you added electron withdrawing CF3 groups to the phosphite you would obtain a more reactive ylide. The more reactive ylide reacts quicker and once again the reaction is under kinetic control. The Z isomer is the result. The Still-HWE method comprises the use of a special base, potassium hexamethyldisilamide (KHMDS). Ketones are hard to react by stabilized ylides and the stereochemical selectivity is poor. All of this sounds magnificent and it is, however one should realize that all of this is highly variable. None of the reactions listed here are ideal and mixtures of isomers are the norm. In most of the cases one can forecast the predominant product stereochemistry, however in most of the cases one will have to be made for a surprise. A) This is well-situated than its rival, the Reformatsky reaction and has been employed to synthesize hitherto unknown compounds. B) The position of the carbon-carbon double (C=C) bond is certain. In specific, it takes place by total positional selectivity (that is, an alkene for all time directly substitutes a carbonyl group). By comparison, a number of other carbonyl olefination reactions frequently take place by double-bond rearrangement. C) The stereochemistry of the products can be regulated. The factors which affect E-and Z-stereoselectivity are well comprehended and can be readily controlled via careful choice of the phosphorus reagent and reaction conditions. D) The yield usually is more than in Reformatsky. E) This can occur in the presence of ester group.